UMWA on the March in Waynesburg, PA! President Roberts, along with thousands of UMWA members and supporters, begin the march from the Waynesburg Airport to the Greene County Fairgrounds for the April 1 Solidarity Rally. 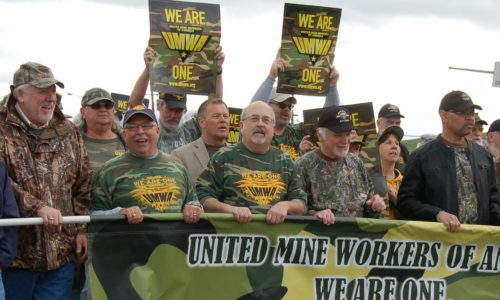 April 1 has great significance for the United Mine Workers of America. It is a day that represents the Union’s triumph over countless struggles throughout its history. This year UMWA members, their families and friends fathered in Waynesburg, PA, to commemorate this important date. While there were many references to the Union’s past victories, ‘Mitchell Day’ 2016 was about putting anyone who suppresses the rights of workers on notice. The UMWA will be there to confront and defeat those who attempt to steal the benefits UMWA members have earned over a lifetime of work. And the Union will oppose anyone who tries to turn back the clock on the gains made by middle class Americans. UMWA members assembled at the Waynesburg Airport in preparation for the Solidarity March. Thousands of UMWA members, their families and supporters drove or road buses to participate. 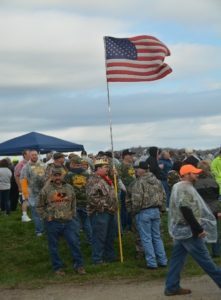 With more than 5,000 UMWA members, families and supporters close behind President Reberts, Secretary-Treasurer Kane, members of the International Executive Board and a host of Union Leaders and Elected Officials led over a mile-long march from the Waynesburg Airport to rally at the Greene County Fairgrounds. 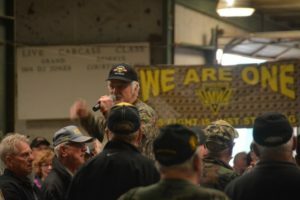 The event was held to demonstrate the Union’s solidarity and marks the beginning of the latest phase of the UMWA’s campaign to stop the assault on American workers and the destruction of their communities. In the past decade alone members of the UMWA have fought vigorously against the ill-conceived policies of the U.S. Environmental Protection Agency, the immoral use of the Nation’s despicable bankruptcy laws by coal operators seeking to shed their responsibility to UMWA workers and retirees and the unrelenting efforts by big business and the wealthy class to roll back workers’ rights and protections. The march in Waynesburg represents an escalation in the Union’s tactics to stop these efforts and restore fairness to the system. To read the full article, contact the Journal Department (journal@umwa.org or 703-291-2405) and subscribe to the United Mine Workers Journal.